This page is for older Maytag washers with two belts. Is your Maytag washer leaking? If so, it can damage your floor beyond repair. Fortunately, this washer repair guide can help. In this guide I will walk you through the steps in repairing Maytag washers that are leaking. These are the same steps I take in repairing washers professionally. So read each section carefully and your washer will be repaired in no time. Note that some of the parts I mention below may not be on your washer, just skip that section and move to the next. 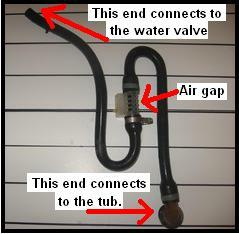 On old Maytag washers there was an air gap in the hose going from the valve to the tub. In my opinion there was no good reason for it to be there but it was and it often leaks. To determine if your washer has an air gap, open the lid and start the washer. If the water enters the tub from a white shoot at the back of the tub, then your washer doesn’t have an air gap, skip this section. If the water enters the tub from under the top lip of the tub then your washer has an air gap and it is a good chance it’s causing your leak. To check this, first remove the front panel off the washer by removing the two screws from the bottom of the front panel. If you have a newer model, prize the bottom clips with a screwdriver then pull the bottom of the panel until the top clips release. Next remove the 3/8 hex head screws pointing upward holding the top down, lift up the top. Once off, you should see the air gap to the left of the tub. Now start the washer, keep an eye on the air gap because right when you start the washer is when it will leak. If it doesn’t leak, stop and start the washer repeatedly watching the air gap for leaks. If at any time it leaks loosen the hose clamp and remove the hose going to the valve. When you remove the hose, a rubber sleeve should be in the end of the hose, this is the part that you need to replace. Note that you must remove the nozzle from inside the rubber sleeve and save it to be reinstalled in the new sleeve. Tip- when reinstalling the sleeve into the valve hose, lubricate it with liquid soap, otherwise the rubber will fold over causing the air gap to leak again. The air gap can be purchased at AppliancePartsPros.com. 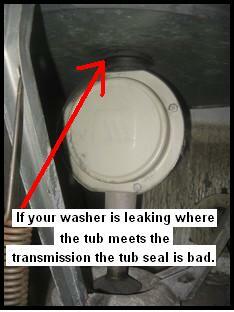 The tub seal is the most common thing that causes Maytag washers to leak. To check if the tub seal is bad, first remove the front panel by removing the two screws from the bottom of the front panel. If you have a newer model, prize the bottom clips with a screwdriver. Then pull the bottom of the panel until the top clips release. Then start the washer and watch for a leak around transmission where it goes through the tub. If it does leak then the tub seal is bad and needs replacing. If you have the tool or willing to buy it click here for instructions on how to replace the tub seal. If the tub seal doesn’t, leak you probably found the leak while performing this test. If your Maytag washer is leaking it may be overfilling. If your washer is overfilling the water valve, water level control or the water level hose is bad. To check this, first open the lid and turn on the washer so the water starts running in the tub. Then turn the washer on and off repeatedly (at least 20 times). If at any time the water doesn’t stop when you turn the washer off, the valve is bad and needs replacing. If the water stops each time you turn the washer off, perform the next test. Set the water level control at the lowest setting and start the washer. Once the water stops running, move the water level control to the next setting, repeat until the washer is full. If at any time the tub gets completely full unplug the washer. If when you unplug the washer the water doesn’t stop running cut off the water at the wall and replace the water valve. If the water stops when you unplug the washer, the problem is the water level control or the water level hose is stopped up. Check to see if the hose is stopped up, if not replace the water level control. The water level control and the water valve can be purchased at AppliancePartsPros.com.